Cooler temperatures and autumn-toned landscapes – the fall season in Sacramento is simply breathtaking, just begging Sacramentans to enjoy the outdoors all season long. While we always love seeing you around the gym, we also hope you and your family take advantage of the healthy, family-friendly activities we have here in our beloved Sactown communities. Run to Feed the Hungry – Join the Cal Fit crew as we run or walk the 10K and 5K races on Thanksgiving morning to support the local Sacramento Food Bank and Family Services. The race starts on J Street in Sacramento near the entrance to Sacramento State and runs through the beautiful tree-lined streets of East Sacramento. Bike Trails – All of greater Sacramento, from Davis to Folsom and Elk Grove to Roseville, is littered with adventurous trails with breathtaking views for both amateur and experienced riders alike. 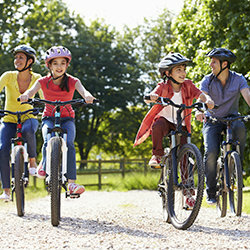 Load up the family and bicycles for an afternoon ride around the American River Parkway trail, Folsom Lake and Lake Natoma trails, or even ride around your own community neighborhood. Apple Hill – With more than 50 apple and fruit farms, bakeries, wineries and tree farms, Apple Hill is a highly desired family destination for more than 50 years. Located just east of Placerville, take a day (or weekend) trip to enjoy all that the region has to offer including the infamous apple picking opportunities, apple-infused everything (think: donuts, beer and wine, jams, etc. ), gorgeous scenery and more. It’s a perfect family getaway. Local Farms – Being so lucky to live right in the heart of the farm-to-fork capital of America, take advantage of the local farms right in your very own backyard for a farm tour, fresh produce, picking adventures, educational workshops and more. Fish Hatchery and Nature Trail – Located just east of Sacramento, Nimbus Hatchery offers visitors fun and educational activities for families of all ages along with an on-site nature trail alongside the beautiful American River to view wildlife and enjoy the outdoors. Downtown Sacramento Ice Rink – The popular Downtown Sacramento Holiday Ice Rink is a seasonal landmark on K Street for more than 20 years, offering families a playful escape into a winter wonderland. Enjoy the exercise and fun all holiday season long, from November through January. Sacramento River Train – A local and family-owned business dedicated to preserving a piece of Northern California history, the Sacramento River Train spans 28 miles from West Sacramento to Woodland. It offers seasonal and adventurous train rides at a leisurely 10-15 mph pace, fun for the entire family. Farmers Markets – Visit your local farmers markets to choose quality fresh produce, meats, cheeses and more from a variety of local farms, as well as handcrafted items from local small businesses. Most farmers markets are open year-round for the whole family to enjoy. And don’t forget! 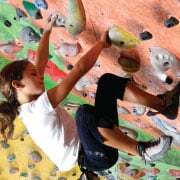 Here at your local Cal Fit location, we have many ongoing and super fun amenities just for you and your family to enjoy all year long, including family yoga, indoor rock climbing and swimming. So whether you’re out and about on a trail or grabbing yoga mats for a family yoga class, we’ll see you out there enjoying the fall amusement!